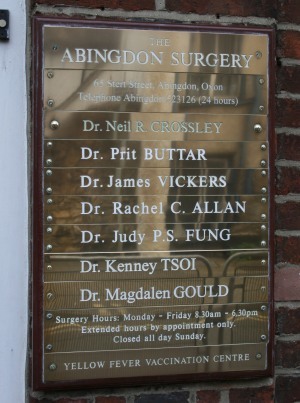 Dr. Neil R Crossley retired today after 32 years and 6 months at The Abingdon Surgery. He joined Dr Vivian, Schofield and Cave on April 1st 1981, when there was a modest two-up-two-down practice on Stert Street. Since then the practice has expanded and taken over neighbouring buildings and hired nurses and become a yellow fever vaccination centre. Our family have been with him for most of that time and seen him rise up the list, which Dr Buttar will now top. According to his goodbye message – on the practice website – Dr Crossley will continue as a GP appraiser, and do some Locum work, and continue to support Arsenal. Dr. Crossley did take to twitter for a brief spell. On 30 Mar 2011 he said “That was hard work. 1 person ill enough for hospital, lots of poorly kids, as well as the usual. And it rained, and I’m still here ca va”. Enjoy the locum work and your retirement and thanks for all you have done! A contribution to the City Daily Photo Blogs October 1st theme – details. 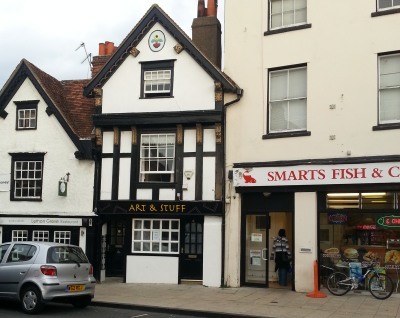 A shop will be opening on Wednesday near The Square in Abingdon. The shop has been decorated and the sign was painted yesterday. The new shop will sell paintings and art; antiques, collectibles and some quirky stuff. 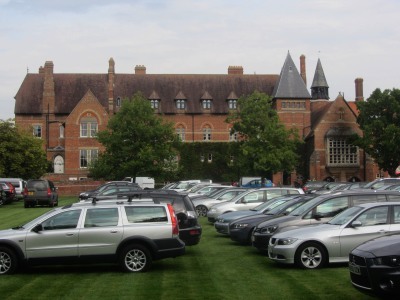 Abingdon School had an Open Day this morning for pupils considering coming to Abingdon next school year. St Helen & St Katherine also had open day today. 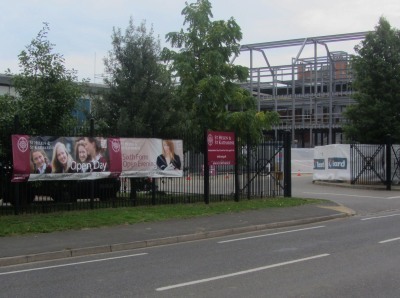 Their new Science Centre looks very prominent now. 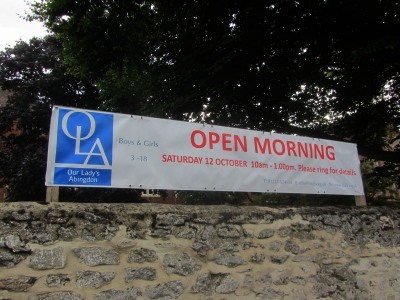 Our Lady’s Abingdon also have an Open Morning soon. 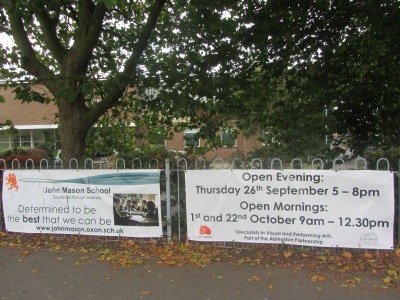 John Mason had their Open Evening last week. They have two open mornings to come. 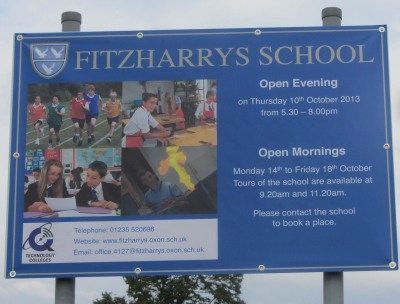 Fitzharrys will have an Open Evening and two Open Mornings. 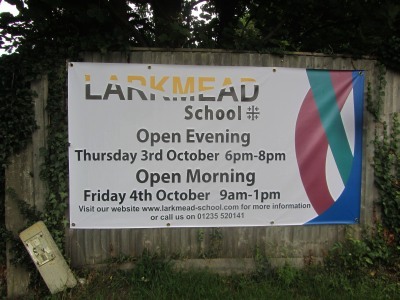 Larkmead will also be open evening and morning. Thanks to both John Mason and Fitzharrys for telling me about their open days, and how well they are both doing. 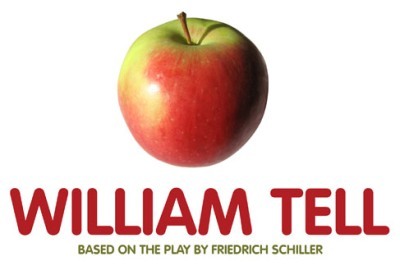 Abingdon Drama Club are performing William Tell this week. There may still be tickets for Friday and Saturday available from their web site. Since the Mayor’s Chaplain, David Fleming, (seen above with wife Beth at their leaving do) has gone to Luton, other people are being asked to lead the start of council prayers. This time it was the turn of the Abingdon Muslims. 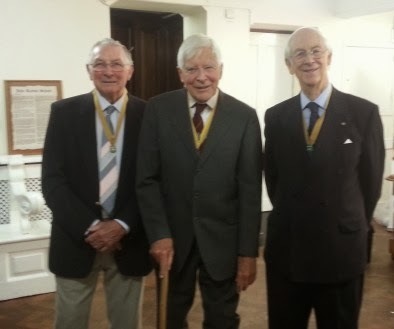 At the start of the Town Council meeting three former mayors, who are also Freemen, had the new freedom bar added to their past Mayor’s Badge in a small ceremony. This new accolade was given to the most recent Freeman Janet Morgan and is being backdated. 8th Nov – Mayor’s Charity Quiz with meal and Paul Mayhew Archer taking the quiz. Always fun even in a loosing team. 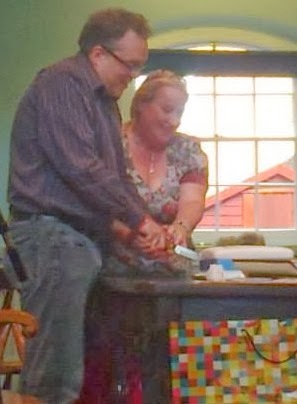 Then it was down into the first real discussion of the evening. The Vale of White Horse District Council have reduced the number of district councillors and redrawn their ward boundaries, and so have asked the town council about the terms of reference for a new consultation on whether similar changes are needed for the town council. 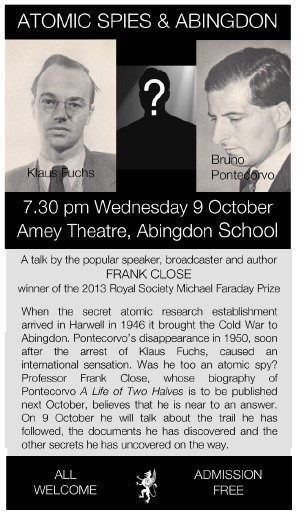 This led to a discussion about whether Abingdon would be better off without the district council. Put to the vote, 8 town councillors wanted to investigate removing a third tier of local government so Abingdon could govern itself better, 7 didn’t want to pursue this option, and the others abstained – not quite what the district council were asking but a radical thought. More from the agenda another day.